Thirty years in the making, Eye of the Lammergeier opens with two American mountaineers, John Ackerly Esq. and Blake Kerr M.D., trying to get as high as they can on the Tibetan side of Everest, in sneakers. 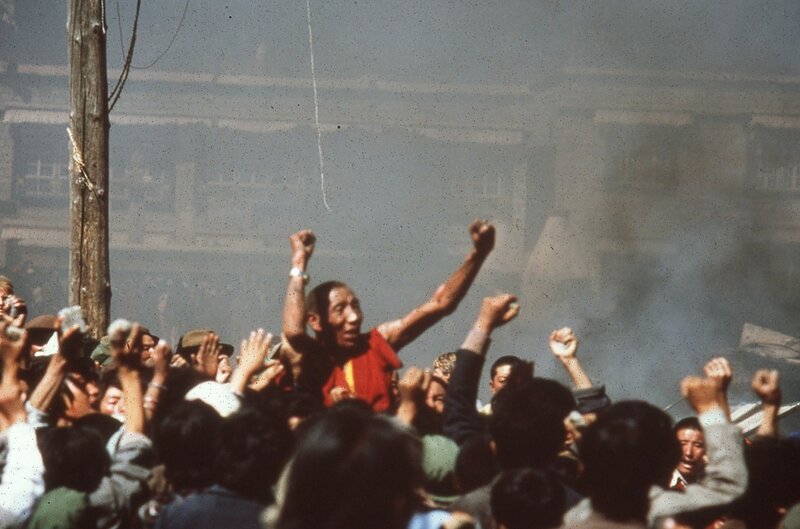 When Chinese police fired on unarmed Tibetans in the capital of Lhasa, Ackerly photographed the largest independence demonstration against Chinese rule since the Dalai Lama fled into exile in India in 1959. After documenting 12 deaths, Dr. Kerr secretly treated the wounded hiding in their homes and monasteries, and met the victims of torture and sterilization. In June 2003, the Comite de Apoyo al Tibet presented a case to the Spanish National Court that charged Jiang Zemin, China's past President and head of the People's Liberation Army, and Li Peng, China's past Prime Minister, with crimes against humanity in Tibet from 1971 to 1998. Under the principal of Universal Jurisdiction, all countries signatory to international treaties have the duty to file charges against countries with no independent judiciaries that are committing genocide. When Dr Kerr testified at the Spanish National Court in December 2011, Judge Ismael Moreno accepted 20 kilos of his written, audio and video documentation, and authorized money for their translation. In February 2014, Judge Moreno submitted arrest warrants to Interpol for Jiang Zemin, Li Peng, and five other Chinese officials, for committing crimes against humanity in Tibet. In July 2014, China convinced Spain to reverse the national Court's finding that China is committing genocide in Tibet and terminate the National Court's pursuit of Universal Jurisdiction. The underside of China's military occupation of Tibet is powerfully revealed by John and Blake returning separately seven times to document Chinese prisons in Tibet, and China's national policy of coerced abortions and sterilization at People's Hospitals in Lhasa and remote regions of Tibet. Hidden camera footage that has never been seen before graphically illustrates the Tibetans' plight. Dr. Blake Kerr is a General Practitioner, human rights activist and author of Sky Burial: an eyewitness account of China's brutal crackdown in Tibet. From the Himalayas to the jungles of Cambodia, Dr. Kerr has explored the collisions between the long arms of U.S. and China’s foreign policy in Asia, including the Khmer Rouge genocide in Cambodia, U.S. bombing in Indochina, and China’s systematic annihilation of Tibet. NY DOCTOR TESTIFIES IN TRIAL ACCUSING CHINESE OF GENOCIDE IN TIBET. 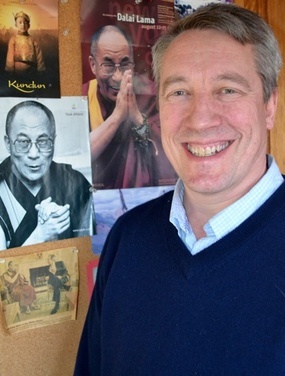 Dr. Blake Kerr, an advisor to the Dalai Lama, renowned human rights activist, and author of the book, Sky Burial, An Eyewitness Account of China's Brutal Crackdown in Tibet, recently returned from Madrid, testifying as the last expert witness in Spain's six-year international trial against Chinese leaders accused of crimes against humanity in Tibet. I sat down with Dr. Kerr in his home in Sag Harbor, New York. Q. How did you become a human rights activist and expert witness in a court of Universal Jurisdiction? A. Karma. 24 years ago, as a tourist in Lhasa, Tibet's capital, witnessing Chinese soldiers and police massacring unarmed Tibetans, inspired me to begin documenting the underside of China's military occupation of Tibet, which later became irrefutable evidence of China's genocide in Tibet. Q. Set it up: How did you come to find yourself in one of the holiest and highest cities in the world? A. In 1987, after graduating from medical school, my college-friend from Dartmouth, John Ackerly, and I bought one-way tickets to Hong Kong, took trains across China, and traveled overland across Tibet to climb as high as we could on Mt. Everest. After three months of travel, we returned to Lhasa, Tibet's capital, arriving at the beginning of a series of Tibetan protests against Chinese occupation. A. It was October 1, 1987, Chinese National Day, the equivalent of our Independence Day. Several Buddhist monks carrying the outlawed Tibetan flag began a non-violent protest in front of the Jokhang Temple, the most sacred Buddhist temple in Tibet, chanting in unison, "China out of Tibet," and "Free Tibet." As local Tibetans joined the march, the crowd swelled. Dozens of Chinese police arrived, beating innocent bystanders with shovels and rifle butts. The police dragged monks into the local police station. Once behind closed doors, the monks were tortured and executed. In revolt and in defense of the monks, Tibetans overturned the Chinese's jeeps and stormed and burned the police station, and the Chinese police open-fired on the crowd. Q. What did you witness that day? A. I saw Chinese police shooting Tibetan men, women and children from the rooftops, and while hiding behind poles, walls and windows. I watched in horror as a Chinese soldier shot a 10-year old boy through the heart, soon dying in his father's arms while I tried unsuccessfully to save him. I consoled a mother as she cradled her dead 16-year-old son, beaten to death beyond recognition with a shovel, and I watched as other Tibetans were shot and beaten by the Chinese. It was a mad, furious, scene, and in a short period of time, as a young doctor, I confirmed 12 deaths. I knew to say, Amchi yin, I am a doctor (literally "doctor am"). Working without many medicines or anesthesia, I found myself treating severely burnt monks and victims of gunshot wounds and torture. It took three days to clean the blood from my hands. A. Over the following days, while the Chinese soldiers removed Tibetan victims from hospitals and transferred them to prison to be tortured, I made secret house calls; sneaking out at night, climbing over walls and rooftops, tending to the sick, wounded and dying in Tibetan's homes and monasteries. Brutal stuff, lots of infections and internal bleeding. That's when I made the gruesome discovery that would change my life. A. While treating a young man with a bullet wound through his calf, his 19-year-old wife, Kunyang, informed me that when she was six-months pregnant with her first child, the Chinese ordered her to the People's Hospital, where she was given an injection into her abdomen, forcing a premature birth. She told me she heard her baby cry twice: once when her son was born, and the second time when the Chinese doctors gave the newborn a lethal injection in his head. The following day, the doctors performed a second operation to sterilize Kunyang. I soon learned two things: Kunyang's story was pervasive throughout Tibet, and the Chinese police were hunting me. After fleeing Tibet, I began medically documenting China's torture of Tibetan political prisoners, and China's national policy of coerced abortions, sterilization, and infanticide (infant homicide) in Tibet. Q. Explain the importance and magnitude of this trial and your involvement. A. On January 10, 2006, Spain's National Court began international proceedings against China's former president, Jiang Zemin; former Prime Minister, Li Peng, and other Chinese leaders, with charges of genocide, crimes against humanity, torture, "forced disappearance and arbitrary execution," over a 27-year period, from 1971-1998. A charge of genocide in an international court is very difficult to prove. After my first experience in Lhasa, I spent the following 13-years traveling back to Tibet, India and Nepal, collecting and documenting China's national and orchestrated human rights violations against Tibetans, including first-person accounts, on-sight medical investigations, photography, and hidden video and audio tapes. I was the trial's final expert witness. After my testimony, the judge accepted all my documentation, approximately 44 pounds of evidence. The next step is seeing if the judge will issue arrest warrants against the Chinese leaders through Interpol. Q. You've met and counseled the Dalai Lama five times, and he also wrote the Foreword to your book, "Sky Burial, An Eyewitness Account of China's Brutal Crackdown in Tibet." How does that feel? A. I am grateful on many levels. This post originally appeared on the Sag Harbor Express.